(From Nikon lens literature) Very lightweight Magnesium die-cast construction body design (Approx. 7.6lbs) with tripod mounting foot. Easier to carry and handle under demanding action conditions. Exclusive Nikon Silent Wave Motor provides ultra-high-speed and accurate autofocus along with super-quiet operation. Fast, precise and accurate, this Nikon technology adds significantly to picture taking performance. M/A mode provides instant switching from autofocus to manual focus with virtually no time lag, even during AF servo operation. A quick touch-up on focus without delay or slack response can make the difference between crisp sharpness, or just slightly out of focus. Optical design features three high performance Extra Low (ED) Dispersion optical glass elements to control secondary chromatic aberrations. Produces very sharp and high contrast images throughout the focusing range and at every f/stop. Legendary ED glass ensures crisply sharp focusing throughout the color spectrum. Optical design features three high performance Extra Low (ED) Dispersion optical glass elements to control secondary chromatic aberrations. Produces very sharp and high contrast images throughout the focusing range and at every f/stop.. Legendary ED glass ensures crisply sharp focusing throughout the color spectrum. Closest focusing distance during AF operation is approx. 16 feet; provides reproduction ratio of 0.12. Dramatic close-up portraits that reveal details and textures are within the close-up range of this lens. 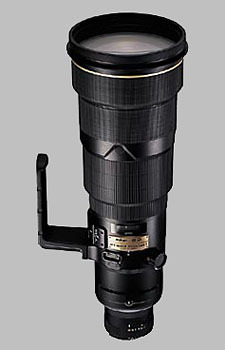 The Nikon 500mm f/4D ED-IF II AF-S Nikkor doesn't have any user reviews yet!